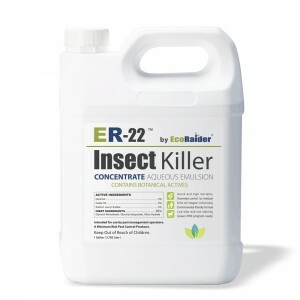 Reneotech announces the launch of ER-22, a concentrate formulation of its popular botanical EcoRaider Insect Killer. ER-22 refers to the product’s 2x strength of the existing RTU formula. EcoRaider is used by Pest Management Professionals (PMPs) as an efficient and green solution that delivers both quick kill and strong residual for bed bug and other pest control. The current RTU formula of EcoRaider is industry tested against bed bugs including resistant populations. ER-22 by EcoRaider delivers the same performance with better cost to end users and provides effective control for all environments, especially sensitive ones. In addition to bed bugs, ER-22 also includes perimeter ant control on the label. A field study by Purdue University proved that it delivers a one-minute kill and leaves behind a four-week residual against odorous house ants. ER-22 is diluted up to a 1:1 ratio for bed bugs treatment and 5:1 for perimeter ant applications. According to Todd Zon, vice president of Reneotech, the manufacturer of EcoRaider, the new product gives PMPs a more powerful tool in the fight against bed bugs and other pests. “It is a product that PMPs have been asking for so this is a direct response to an industry need,” said Zon. Available from distributors nationwide, ER-22 will come in a one-gallon jug and can be purchased in cases of four.